Siege of Aleppo: many truths to tell? Robert Fisk, iconoclastic as ever: this time on Syria. Some of his argument here – that the rebels in Aleppo include a large number of radical jihadi slamists, that they have killed civilians and committed other heinous crimes during the city’s seige – seem uncontroversial. Even if his contention that reporting of these in international media has been knowingly circumscribed in deference to Western political agendas seems a bit far-fetched. What’s really missing, however, is any sense of proportion. Syrian forces and their Russian, Iranian and Iraqi Shia militia allies are in possession of over-whelmingly stronger military firepower, and have accordingly been responsible for damage, destruction and killing on a far, far wider scale than anything the ‘insurgents’ have managed. This, moreover, alongside the fact that as a ruling government, the Assad regime has a fundamental duty to protect their country and citizens – not barrel-bomb, gas and shoot them. There is, as Fisk says, more than one truth to tell from Aleppo. But not all stories – as he seems to be implying – carry equal moral or political weight. The main (but not only) story from Aleppo – it seems to me – remains the one encapsulated in the UN Commissioner for Human Right’s contention that there’s evidence suggesting that war crimes may have been committed in Aleppo over the last week. And no amount of special pleading should be allowed to obscure that grim fact. Our political masters are in league with the Syrian rebels, and for the same reason as the rebels kidnap their victims – money. Western politicians, “experts” and journalists are going to have to reboot their stories over the next few days now that Bashar al-Assad’s army has retaken control of eastern Aleppo. We’re going to find out if the 250,000 civilians “trapped” in the city were indeed that numerous. We’re going to hear far more about why they were not able to leave when the Syrian government and Russian air force staged their ferocious bombardment of the eastern part of the city. They did, after all, include al-Qaeda (alias Jabhat al-Nusra, alias Jabhat Fateh al-Sham), the “folk” – as George W Bush called them – who committed the crimes against humanity in New York, Washington and Pennsylvania on 11 September 2001. Remember the War on Terror? Remember the “pure evil” of al-Qaeda. Remember all the warnings from our beloved security services in the UK about how al-Qaeda can still strike terror in London? Not when the rebels, including al-Qaeda, were bravely defending east Aleppo, we didn’t – because a powerful tale of heroism, democracy and suffering was being woven for us, a narrative of good guys versus bad guys as explosive and dishonest as “weapons of mass destruction”. Back in the days of Saddam Hussein – when a few of us argued that the illegal invasion of Iraq would lead to catastrophe and untold suffering, and that Tony Blair and George Bush were taking us down the path to perdition – it was incumbent upon us, always, to profess our repugnance of Saddam and his regime. We had to remind readers, constantly, that Saddam was one of the Triple Pillars of the Axis of Evil. So here goes the usual mantra again, which we must repeat ad nauseam to avoid the usual hate mail and abuse that will today be cast at anyone veering away from the approved and deeply flawed version of the Syrian tragedy. Yes, Bashar al-Assad has brutally destroyed vast tracts of his cities in his battle against those who wish to overthrow his regime. Yes, that regime has a multitude of sins to its name: torture, executions, secret prisons, the killing of civilians, and – if we include the Syrian militia thugs under nominal control of the regime – a frightening version of ethnic cleansing. Yes, we should fear for the lives of the courageous doctors of eastern Aleppo and the people for whom they have been caring. Anyone who saw the footage of the young man taken out of the line of refugees fleeing Aleppo last week by the regime’s intelligence men should fear for all those who have not been permitted to cross the government lines. And let’s remember how the UN grimly reported it had been told of 82 civilians “massacred” in their homes in the last 24 hours. But it’s time to tell the other truth: that many of the “rebels” whom we in the West have been supporting – and which our preposterous Prime Minister Theresa May indirectly blessed when she grovelled to the Gulf head-choppers last week – are among the cruellest and most ruthless of fighters in the Middle East. And while we have been tut-tutting at the frightfulness of Isis during the siege of Mosul (an event all too similar to Aleppo, although you wouldn’t think so from reading our narrative of the story), we have been willfully ignoring the behaviour of the rebels of Aleppo. Only a few weeks ago, I interviewed one of the very first Muslim families to flee eastern Aleppo during a ceasefire. The father had just been told that his brother was to be executed by the rebels because he crossed the frontline with his wife and son. He condemned the rebels for closing the schools and putting weapons close to hospitals. And he was no pro-regime stooge; he even admired Isis for their good behaviour in the early days of the siege. Well, so it came to pass. In three vast columns of suicide trucks and thousands of armed supporters, Isis has just swarmed across the desert from Mosul in Iraq, and from Raqqa and Deir ez-Zour in eastern Syria to seize the beautiful city of Palmyra all over again. It is highly instructive to look at our reporting of these two parallel events. Almost every headline today speaks of the “fall” of Aleppo to the Syrian army – when in any other circumstances, we would have surely said that the army had “recaptured” it from the “rebels” – while Isis was reported to have “recaptured” Palmyra when (given their own murderous behaviour) we should surely have announced that the Roman city had “fallen” once more under their grotesque rule. Words matter. These are the men – our “chaps”, I suppose, if we keep to the current jihadi narrative – who after their first occupation of the city last year beheaded the 82-year-old scholar who tried to protect the Roman treasures and then placed his spectacles back on his decapitated head. By their own admission, the Russians flew 64 bombing sorties against the Isis attackers outside Palmyra. But given the huge columns of dust thrown up by the Isis convoys, why didn’t the American air force join in the bombardment of their greatest enemy? But no: for some reason, the US satellites and drones and intelligence just didn’t spot them – any more than they did when Isis drove identical convoys of suicide trucks to seize Palmyra when they first took the city in May 2015. There’s no doubting what a setback Palmyra represents for both the Syrian army and the Russians – however symbolic rather than military. Syrian officers told me in Palmyra earlier this year that Isis would never be allowed to return. There was a Russian military base in the city. Russian aircraft flew overhead. A Russian orchestra had just played in the Roman ruins to celebrate Palmyra’s liberation. So what happened? Most likely is that the Syrian military simply didn’t have the manpower to defend Palmyra while closing in on eastern Aleppo. They will have to take Palmyra back – quickly. But for Bashar al-Assad, the end of the Aleppo siege means that Isis, al-Nusra, al-Qaeda and all the other Salafist groups and their allies can no longer claim a base, or create a capital, in the long line of great cities that form the spine of Syria: Damascus, Homs, Hama and Aleppo. Back to Aleppo. The familiar and now tired political-journalistic narrative is in need of refreshing. The evidence has been clear for some days. After months of condemning the iniquities of the Syrian regime while obscuring the identity and brutality of its opponents in Aleppo, the human rights organisations – sniffing defeat for the rebels – began only a few days ago to spread their criticism to include the defenders of eastern Aleppo. Take the UN High Commissioner for Human Rights. After last week running through its usual – and perfectly understandable – fears for the civilian population of eastern Aleppo and their medical workers, and for civilians subject to government reprisals and for “hundreds of men” who may have gone missing after crossing the frontlines, the UN suddenly expressed other concerns. 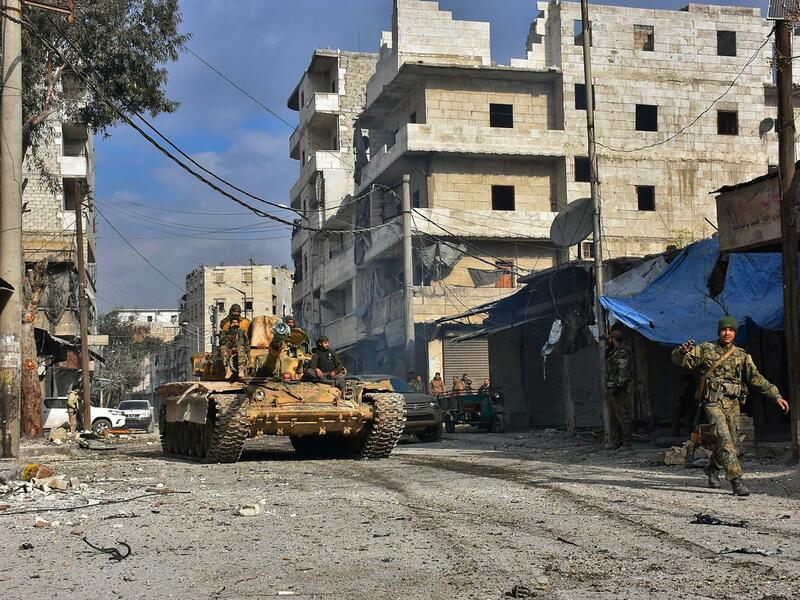 “During the last two weeks, Fatah al-Sham Front [in other words, al-Qaeda] and the Abu Amara Battalion are alleged to have abducted and killed an unknown number of civilians who requested the armed groups to leave their neighbourhoods, to spare the lives of civilians…,” it stated. “We have also received reports that between 30 November and 1 December, armed opposition groups fired on civilians attempting to leave.” Furthermore, “indiscriminate attacks” had been conducted on heavily civilian areas of government-held western as well as ‘rebel’ eastern Aleppo. I suspect we shall be hearing more of this in the coming days. Next month, we shall also be reading a frightening new book, Merchants of Men, by Italian journalist Loretta Napoleoni, on the funding of the war in Syria. She catalogues kidnapping-for-cash by both government and rebel forces in Syria, but also has harsh words for our own profession of journalism. Is this too harsh on my profession? Are we really “in league” with the rebels? Certainly our political masters are – and for the same reason as the rebels kidnap their victims: money. Hence the disgrace of Brexit May and her buffoonerie of ministers who last week prostrated themselves to the Sunni autocrats who fund the jihadis of Syria in the hope of winning billions of pounds in post-Brexit arms sales to the Gulf. In a few hours, the British parliament is to debate the plight of the doctors, nurses, wounded children and civilians of Aleppo and other areas of Syria. The grotesque behaviour of the UK Government has ensured that neither the Syrians nor the Russians will pay the slightest attention to our pitiful wails. That, too, must become part of the story.